Extrasolar planet Upsilon Andromedae d, which lies in the habital zone of the Sun-like star Upsilon Andromedae A. 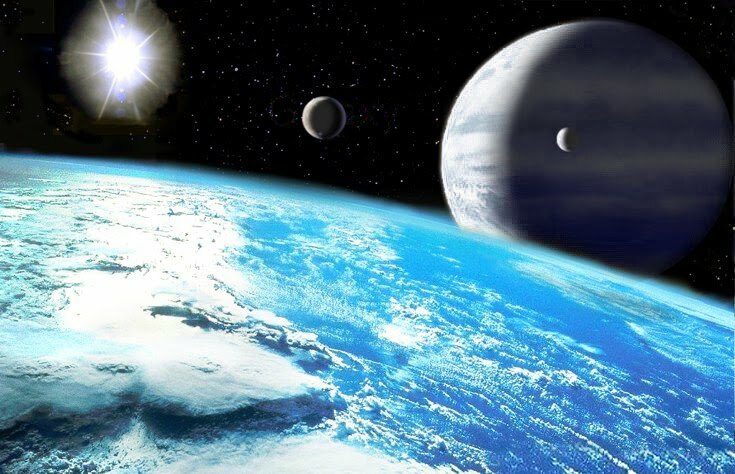 The star, about 40 light years from Earth, is known to host three planets. Artist's hypothetical rendering by Lucianomendez, via Wikipedia Commons. Jay Goodwin recalls the late-night 1969 moon landing vividly. His mother woke him up so he could watch Neil Armstrong step onto the lunar surface. “It was a big deal. I still remember every detail on TV, and going outside to look up at the moon,” Goodwin says. He is now a chemist at Emory, working in the lab of David Lynn, a lead researcher for the NASA-NSF Center for Chemical Evolution. Like a lot of kids who grew up in the heyday of the space race, Goodwin once dreamed of becoming an astronaut. Little did he know that as a chemist, he would be helping in the search for life beyond Earth. At the request of NASA and the NSF, Goodwin and Lynn pulled together an international group of scientists in Washington this month to give their input during a workshop called “Alternative Chemistries of Life: Empirical Approaches.” They are now drafting suggestions to the government agencies for how to hone in on the search for other “Earths,” in light of the extraordinary number of exoplanets that powerful telescopes have unveiled. 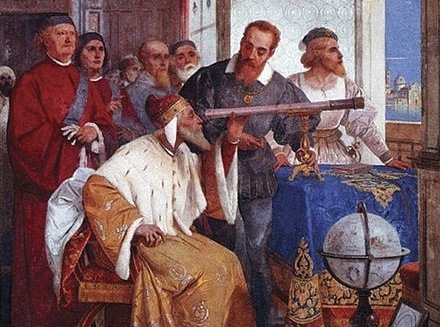 Galileo shows aristocrats of Venice how to use a telescope in a fresco by Giuseppe Bertini. For centuries, advances in our understanding of the universe were measured at a glacial pace. From the realization that the Earth is not flat, to the daring proposition that the Sun was the center of our solar system, on up to the Big Bang model, the mysteries slowly unraveled. Now things have speeded up considerably. 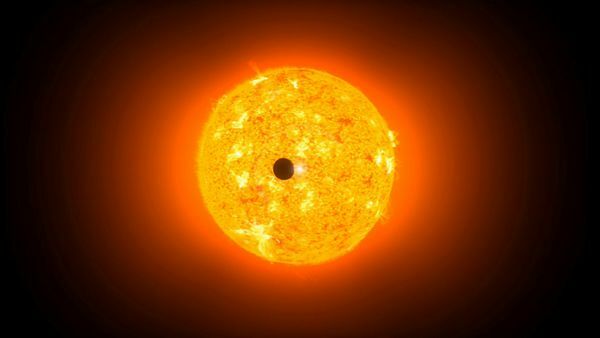 The heady era of manned space exploration may have temporarily plateaued, but powerful space-based telescopes like the one on NASA’s Kepler Mission are rapidly boosting our knowledge. Nearly 800 exoplanets have been discovered, including a handful in the habitable zones around stars, where liquid water is possible. It’s estimated that each of the 100 billion stars in our Milky Way harbor one or more planets, which heightens the possibility that our galaxy could be teeming with life in some form or another. From Earth, we can observe transits of Mercury and Venus when they pass in front of the Sun. Kepler will observe the same phenomena in order to detect Earth-sized planets that are far beyond our solar system. Credit: Dana Berry, NASA Kepler Mission. But subtle factors, such as the tilt of the Earth’s axis and the presence of a moon, may be critical for the organization of life as we know it. So what is life exactly, and how would you know it if you saw it on an alien planet? The more we learn, the more complex that question becomes. Lynn’s work for the Center for Chemical Evolution is focused on understanding supramolecular self-assembly, and how life may have originated on prebiotic Earth. Meanwhile, the Human Genome Project is fueling research into the evolution of DNA and ways that man might generate “synthetic life” in a laboratory. 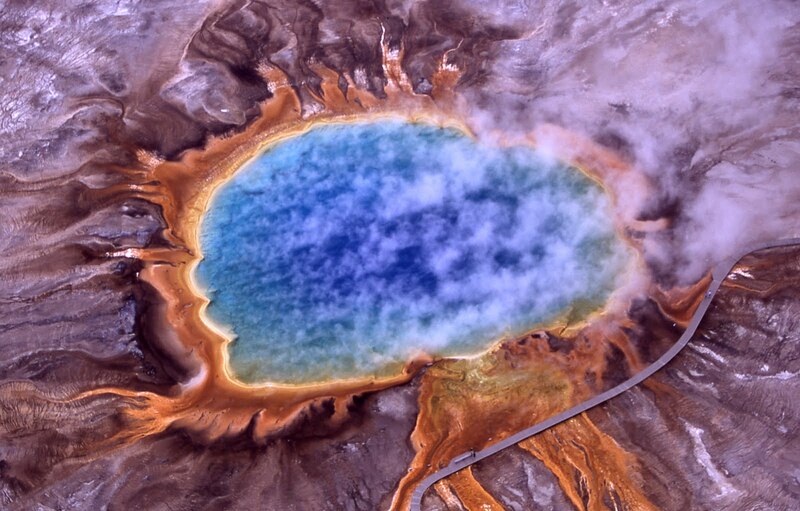 And exploration of unique environments is uncovering examples of extremophiles, organisms that thrive in conditions that would be detrimental to most life on Earth. Thermophiles, a type of extremophile that can exist in scathing heat, produce some of the bright colors of Grand Prismatic Spring, above, in Yellowstone National Park. Credit: Jim Peaco, National Park Service. For the Washington workshop, Lynn and Goodwin invited a range of leading specialists working at the boundary of non-living and living systems. They included microbiologists, marine biologists, geochemists, synthetic chemists, atmospheric chemists, virologists and others. The word cloud above was created from the workshop notes. Click to enlarge. During the next few months, Lynn and Goodwin will be continuing those conversations as they work on developing guidelines to set the tone for a whole new era in the exploration for life.